Recently, I joined two very interesting groups on facebook (fb), the first one is called the Dublin Event Guide (for Free Events), created by Joerg Steegmueller, LINK (you need to be fb member), and it lists lots of free events happening in Greater Dublin area, weekly, which mostly people miss as its hard to get free events info. You should really join it, Joerg does a great work of providing loads of information about whats going on around Dublin. Great work Joerg! 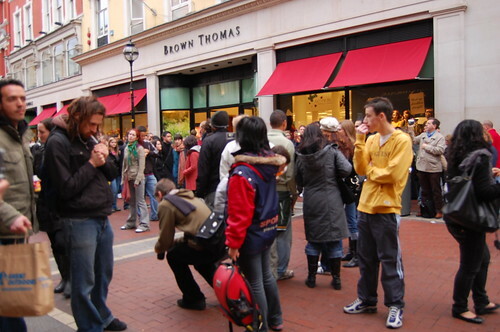 And second one is by Brian Lenehan and its called Dublin Improv Movement (LINK, again need to be fb member) and today I took part in the first Improv, called Grafton Street Freeze, based on this. It was very cool, I did with some friends of mine, in the beginning, we were bit unsure :), but it turned out be brilliant and we freeze’d up for 5 min. More information is on fb group. Looking forward to more of the Improv, some great ideas are lined up. 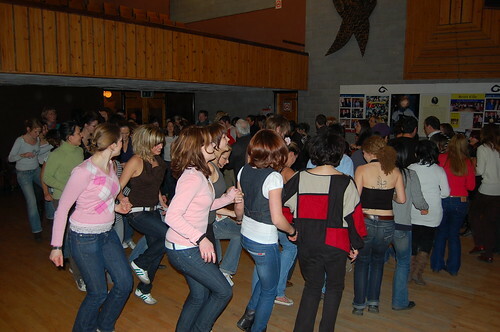 Last weekend, I went to céilí (Irish dance) with friends of mine. We went, which I believe looked like a community center in Monks-town, don’t know the name. Until after we payed and enter the hall, I had no idea that we would actually be dancing, I thought it was more of a show like “little Riverdance”. But no. In the beginning, there were just too many people and everyone was just bumping into each other. It looked like a Intro to Irish Culture sort of thing, as there were lot European students from Germany n France etc. in there, as you see below. One of really cool thing and a bit funny too, had a tea & scone break from organizers in between all the drinking we were doing :). The best part, after the break, half of people left and the dance part became lot more fun and by the end of we are enjoying it a lot. The pic below shows the dance routine called The Siege of Ennis (if i am correct) and i liked it a lot.. very cool :D. It was great fun by the end of the night.